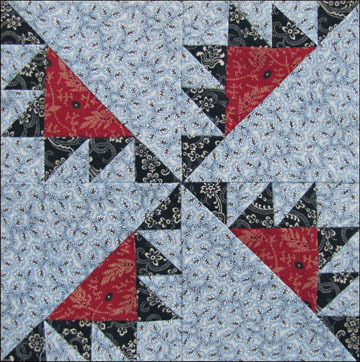 This week's block commemorates Kansas Day. 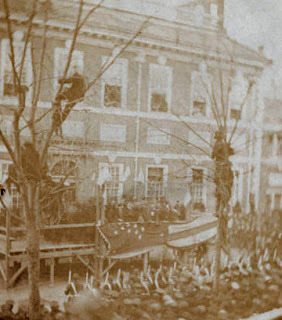 Kansas entered the Union 150 years ago this week on January 29th, 1861. For years the territory had petitioned Congress for statehood, but Southern politicians refused to add a new free state in the West. After Southern Senators paraded out of the Senate Chamber, the remaining majority finally had the votes to create the 34th state in the Union. A few days later the House passed the Kansas statehood bill and on the 29th President Buchanan signed it. an idea that encouraged Northerners and Southerners to use voter fraud and terrorism to advance their agendas. 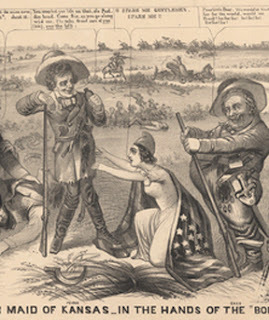 The territory became known as Bleeding Kansas. The Kansas Troubles increased tensions between North and South in the seven years leading up to the formal declaration of War in 1861. Kansas Troubles quilt, about 1850, by L.B. 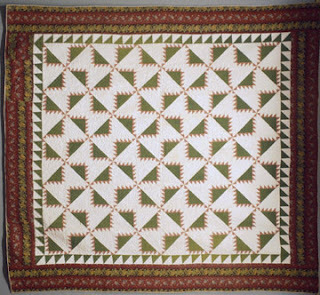 The quilt pattern goes back to the time of the Kansas Troubles, but we have no idea what women called the design then. The pattern name appears in print about 1890. 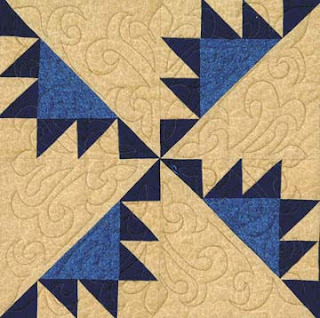 It doesn't matter how many little triangles there are; it's the rotational repeat that makes it a Kansas Troubles. We Kansans love the pattern. Lots of triangles!!! A - Cut 2 light squares 4-7/8". 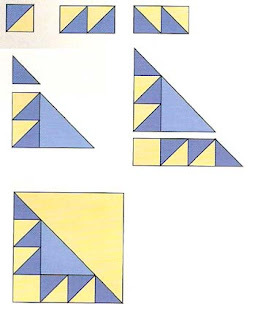 Cut each into 2 triangles with one cut. You need 4 triangles. B - Cut 4 light squares 1-1/2". D - Cut 2 medium squares 2-7/8". Cut each into 2 triangles with one cut. You need 4 triangles. is keeping the small triangles lined up in the right direction. 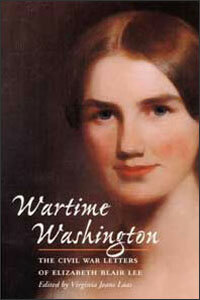 Read more of Elizabeth Blair Lee's letters to her husband in Wartime Washington: The Civil War Letters of Elizabeth Blair Lee, edited by Virginia Jeans Laas. 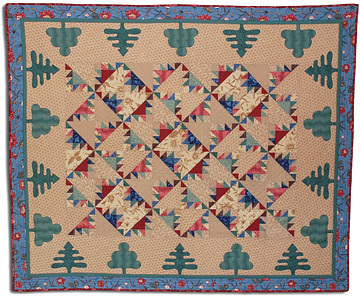 and then typing the word QUILT in the search box---hundreds of quilts and quilt blocks. I love the challenge of piecing this block! As always, I love reading the history you provide with the block. i've always loved this block but never made it before. thanks so much for the block directions, the informative history, and the book recomendations. i can't wait to piece one of these quilts in my future! definitely a 'must have' quilt. I love this block - it's one of my favorites! Looking forward to piecing this one. Thank you so much for another wonderful history lesson too. Thank you so much for writing this blog-I am enjoying reading every post. 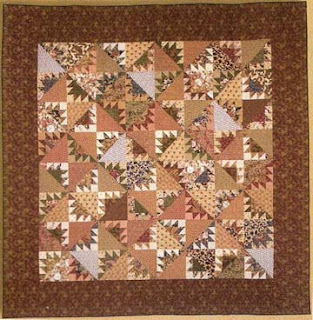 I have been collecting civil war reproduction fabrics the last couple of years, so hope to make these blocks. Love how much movement this block has. Thanks for the great history lesson too! Wow! Great story and great block! Thank you so very much :) I am truly enjoying your weekly blocks....and I've already pre-ordered your Civil War Reunion fabric for the sashing & border. Thanks for the links to the letters book and the museum. Both promise hours of absorbing study. Thanks for doing Kansas Troubles. My son has had a lot of them living there...He's in the ARMY. I found the block in Blockbase #1270 YEA! I look forward to Saturday morning with even more enthusiasm now. I am very happy with how the block turned out. I love getting up Saturday morning to read a little CW history and see what new block I need to make! Yeah! I went to a Quilting and fiber arts show -all venders and picked up som cw pritns to add to my stash. Thanks! I found a picture of a quilt with a nice block pattern in internet. Unfortunately, there was no title to or a label. Maybe there is somebody in blogland can help me? I would intressted the name and perhaps the history of the pattern. It was a wonderful two-color quilt in blue and white. I made a sketchy picture and put in my blog. I would be happy to answer a helping. I enjoyed this last block ... and I have them all! I'm waiting for the next ... THANKS for the story about each one of them! As always, a wonderful bit of history along with a challenging block. I have posted my block on my blog, along with a how-to. I wonderful post! 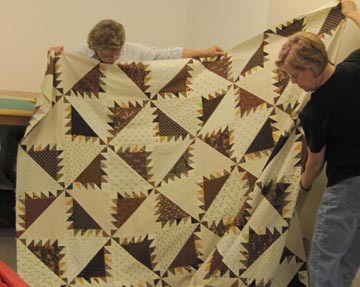 Thank you so much for always sharing the wonderful history of quilting. This block will be the most complicated pieced block I will have attempted so far but here goes. I am going to cut it out tonight and have a go. 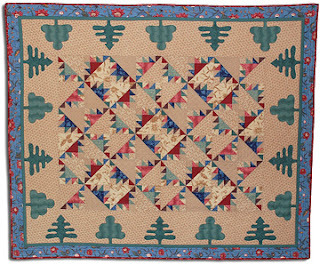 What a wonderful blog ...arrived here from Mornings Minion ...I dont make quilts ...yet... but I dabble with Family History and found that a member of my husbands family faught in the civil war ....how interesting I found the little bit of research I did ... so will enjoy reading your blog as it ties history to craft so well. I love this block and it was so much fun to make. I make triangle squares by layering a dark/light and stitching a scant 1/4 on each side of the diagonal. For these little ones I cut the squares 2 1/4"--they came out very sharp and tidy after trimming.